You can use polystyrene beads at the bottom of a vase to display dried or artificial flowers. The beads will keep the stems steady and raise them to the height you want them to be at. Use them as spacers to glue on to the back of wall mirrors or picture frames. This will help to protect painted walls. Ever caught your hand on a sharp tool when rummaging around in your tool box? Most of us have. You can use polystyrene beads to cover the tips of sharp tools such as screwdrivers and Stanley blades when they are not being used so that they can be stored safely. Polystyrene beads can be really good for spreading glue and other adhesives rather than using a brush. You can simply discard the beads after using them rather than having to clean the brush. You know how easy it is to bash your fingers when you’re trying to drive home a nail with a tiny head into the wall? Well, polystyrene beads can help to protect your fingers. Simply push the tip of the nail through the polystyrene bead to steady it against the wall. Take a few hammer taps, remove the bead, and finish driving the nail into the wall. 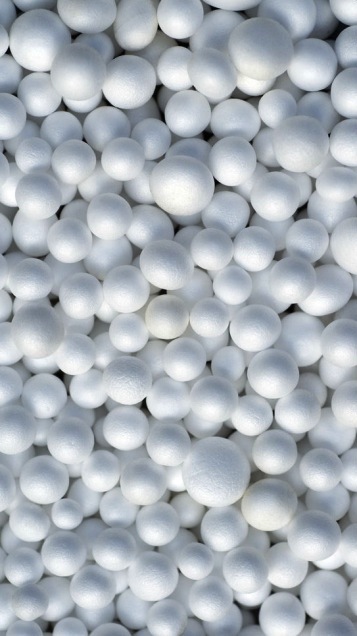 If you have bean bag chairs that have lost their shape then you can use polystyrene beads to refill them. You can use polystyrene beads to help fill up planters. This works well with shallow rooted plants, is good for drainage and also helps large pots to be lighter and easier to move around. The next time you’ve got some polystyrene packaging material left over, why not get creative?